Can You Reheat Lasagna? | Can You Reheat? Q. I’ve often heard people complain that when they are reheating lasagna, the lasagna becomes either gummy and watery or dry and hard. Can lasagna be reheated, and if so, how? A. Yes, lasagna can be reheated, and deliciously so! Those that have complained of a less than desirable reheated result have either failed to keep their lasagna covered during reheating or haven’t kept as close of watch as they should have during the reheating process. To reheat lasagna, you can use a variety of different methods depending on the appliances and supplies you have available. For how to reheat lasagna in a microwave, start by making sure your lasagna is in a microwave safe dish or a plate. You’re also going to want to have some microwave safe plastic wrap to cover the lasagna. Keeping the lasagna covered assures that the moisture is locked in and that your lasagna doesn’t dry out while reheating. For an average personal serving size piece of lasagna, set your timer for two to three minutes. Check that the lasagna has been heated through evenly. If some parts are still cold, try moving the layers around a little bit and reheating at 1 to 2 minute increments of time, checking the internal temperature before serving. For larger servings of lasagna, adjust your microwaving time accordingly. For reheating lasagna in the oven, you’ll want to have some aluminum foil or wax paper handy. If you also happen to have a kitchen thermometer, you can use this to ensure that the lasagna is heated evenly throughout the dish. Start by preheating your oven to 400 degrees Fahrenheit. Make sure your lasagna is in an oven safe pan (baking dishes and lasagna dishes work great! ), and cover your lasagna with the foil or wax paper. Place the dish on the middle rack and allow to reheat until there is an even internal temperature of 165 degrees F throughout – around 40 to 60 minutes, depending on the size of the dish and number of layers. To get the top of the lasagna a little toasty and to make sure it gets warmed up enough, remove the aluminum foil or wax paper and return the lasagna to the oven for an additional ten minutes. Allow the lasagna to rest before serving. There are actually two great ways to reheat lasagna in a skillet. The first is quick and simple, although you will lose the structured, layered look of the dish. In addition to a skillet, you will also need a lid to cover the lasagna. The first method also requires a small amount of either water, pasta sauce, or stock. Add lasagna to the skillet and heat on medium high. To the skillet, add your desired cooking liquid and bring to a simmer. Cover with a lid and stir occasionally, allowing the pasta to soften. Allow to cook for 15 to 20 minutes, and if you desire toastier noodles and sauce, remove the lid and cook for an additional five minutes until the sides of the pasta begin to crisp. Plated, this skillet meal has a more rustic feel and looks gorgeous sprinkled with fresh parmesan and chopped basil. 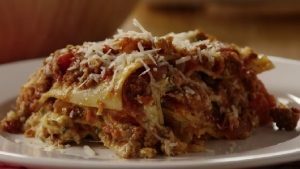 The second method involves removing the leftover lasagna from the fridge and immediately slicing the piece into thin slabs or cubes. The size is really up to you. Heat your skillet (preferably nonstick) to medium high and drizzle in some olive oil. Let each side cook undisturbed until browned and crispy, and then flip the slab. Cheese will start to ooze from the middle layers and crisp up in the oil, binding your layers together and giving the lasagna a tasty crunch. Serve your pan seared skillet lasagna slabs with a side of marinara sauce for a delicious dipper. If you enjoy the corner pieces of regular lasagna, this is the reheating method for you – every piece tastes like a corner! So, in short: Can you reheat lasagna? Absolutely! Sometimes, it’s even better a second time. When looking for creative ways for how to reheat lasagna, these methods are only the beginning. Feel free to get inventive about new ways to reheat or repurpose lasagna leftovers. Just like with the skillet method, there’s more than one way to reheat a lasagna! You’re sure to find the one that works best for you.